For Kristy Smith, each painting she does is small story in itself. While several pieces may have similar colors, each one is done on its own and not in a series. Painting is the way she stays in touch with and expresses the creative energy of life. 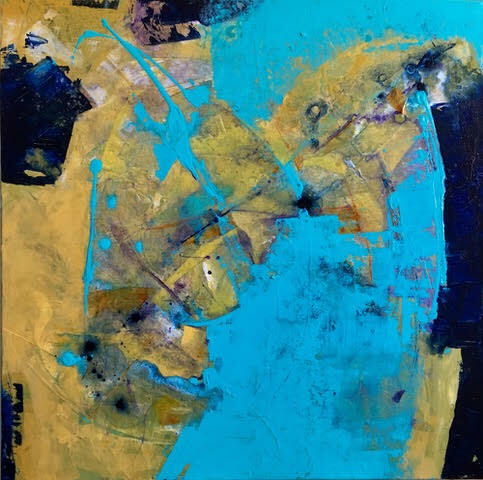 Kristy’s abstract paintings begin with a simple inspiration, such as a color combination, a shape, or a pattern found in the world around her. Once this inspiration is put on canvas, the paintings evolve through intuitive, spontaneous responses to the non-verbal language of the colors and shapes before her. There is no preconceived outcome of how a painting is to look. The work develops freely into its own energetic resolution and expression. For Kristy, there is great freedom and discipline in this process. It requires honoring and trusting what is happening minute by minute on the canvas. There is no right or wrong way to go because there is no definite destination other than the resolution of the work into its own moment of beauty and completeness.The finished work is a celebration in color, line, and shape of life’s complex beauty. 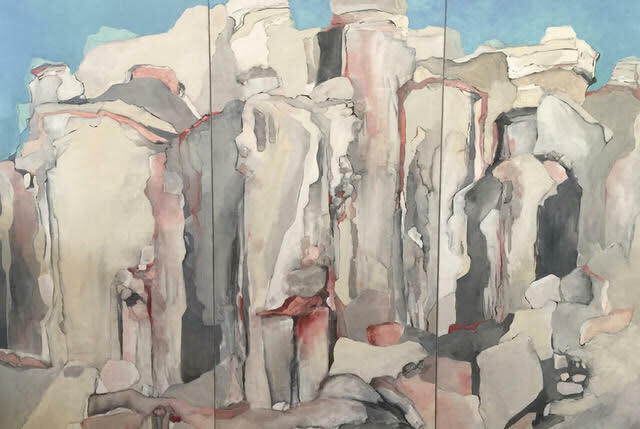 A strong connection to the land and the vegetation that occupies it are the inspiration for the work of Pamela Gilmore Hake. Her abstract paintings are close-up stories or Vignettes of the larger landscape around her. They are beyond literal snapshots in time. Just as one might like to befriend one or two individuals in a crowd, Pamela chooses to let an individual rock or tree or even a few rock forms influence her paintings and drawings. Some of the work is an interpretation of an experience with these individual earthly forms and comes intuitively from her soul. Others might be a memory of a place she has experienced. Either way, drawing with charcoal and then pushing paint, starts the process of this dance with her soul. After all, what is a memory but a small vignette of a life experience.